Imaging techniques of the cornea are developing rapidly, mainly because of recent advances in refractive surgery. To understand the significance of new imaging techniques, the relevant principles of corneal optics are reviewed. The discussion of the most common clinical method of Placido-based corneal topography emphasizes important concepts of its clinical interpretation. The principles and clinical significance of several emerging technologies are reviewed. Curvature of its anterior and posterior surface can be expressed as radii of curvature in millimeters or clinically more often in keratometric diopters. The shape of the anterior and posterior surface also can be expressed in micrometers as the elevation of the actual surface relative to a chosen reference surface (eg, sphere). These 2 concepts can characterize the overall shape and the macro-irregularities of the corneal surface (eg, corneal astigmatism). Local surface changes can be expressed in micrometers. Smoothness of the surface is optically very important, and any micro-irregularities of the corneal surface can significantly degrade the image. Power of the cornea expressed as refraction in diopters is an optical property dependent on the shape of the surfaces and the refractive index of the surface. Thickness and 3-D structure of the cornea can be expressed in micrometers. Changes in the 3-D structure (eg, after refractive surgery) can induce further changes of its shape because of biomechanical changes, such as altered elasticity of the remaining tissue. The keratometric diopter is a concept inherited from keratometry and is calculated simply from radii of curvature, as follows: K=refractive index of 337.5/radius of curvature. This concept is a simplification ignoring the fact that the refracting surface is air-tear interface, and it does not account for the oblique incidence of incoming light in the corneal periphery. As a result, it miscalculates a true corneal refractive index of 1.376 to 1.3375 to correct for some of these factors. That is why these diopters more correctly are termed keratometric diopters to distinguish them from the diopters expressing more precisely the true refractive power at certain corneal point. During adulthood, an average cornea is steeper in the vertical meridian by about 0.5 D compared to the horizontal meridian, which contributes to higher incidence of with-the-rule astigmatism in young adults. This difference between vertical and horizontal curvature diminishes with age, finally disappearing at age 70 years. Lenticular changes contribute significantly to the higher incidence of against-the-rule astigmatism with age. Normal cornea is a prolate surface, ie, steeper in the center and flatter in the periphery. Oblate surface (eg, surface after myopic laser photorefractive keratectomy) is flatter in the center and steeper in the periphery. The visually significant area of the corneal surface is approximately the area with the same diameter as the pupil size. The pupil diameter decreases with age. A large variation exists between people in any age group. In one large study, the average pupil size in individuals aged 20 and 80 years was 4.5 mm and 3.5 mm, respectively, in bright illumination. In dim illumination, the average pupil size in individuals aged 20 and 80 years was 8 mm and 5 mm, respectively. This finding is clinically important because most refractive lasers treat an area with a 6.5-mm diameter with a surrounding blending zone. The average central corneal thickness is approximately 550 µm. In one study, the average thickness in temporal, nasal, inferior, and superior quadrants of the cornea was 590, 610, 630, and 640 µm, respectively. The thinnest site on the entire cornea is located on an average 0.9 mm from the visual axis most commonly in the inferotemporal quadrant. The mechanical properties of human corneal tissue are less well understood. The intact central corneal thickness of 250 µm is considered enough to ensure long-term mechanical stability of the cornea. The peripheral thickness is not well studied, but it is certainly clinically important in some refractive procedures as intracorneal rings or radial and astigmatic keratotomy. With the advances in corneal imaging and widespread refractive surgeries, corneal behavior likely will be understood better. Corneal topography instruments used in clinical practice most often are based on Placido reflective image analysis. This method of imaging of the anterior corneal surface uses the analysis of reflected images of multiple concentric rings projected on the cornea. Multiple light concentric rings are projected on the cornea. The reflected image is captured on a charge-coupled device (CCD) camera. Computer software analyzes the data and displays the results in various formats. Every map has a color scale that assigns a particular color to a certain keratometric dioptric range. Never base an interpretation on color alone. The value in keratometric D is crucial in the clinical interpretation of the map and has to be looked at with the interpretation of every map. Absolute maps have a preset color scale with the same dioptric steps, dioptric minimum and maximum assigned to the same colors for a particular instrument. These maps allow direct comparison of 2 different maps. However, because the steps are in large increments (generally 0.5 D), their disadvantage is that they do not show subtle changes of curvature and can miss subtle local changes (eg, early keratoconus). Normalized maps have different color scales assigned to each map based on the instrument software that identifies the actual minimal and maximal keratometric dioptric value of a particular cornea. The dioptric range assigned to each color generally is smaller compared to the absolute map; consequently, maps show more detailed description of the surface. The disadvantage is that the colors of 2 different maps cannot be compared directly and have to be interpreted based on the keratometric values from their different color scales. Corneal topography most commonly is thought of as Placido-based reflective image analysis. It does not directly measure the x, y, and z coordinates of the points on the corneal surface that are usually used for characterization of objects in 3-D space. Instead, it typically measures the deviation of reflected rings and primarily calculates the curvature of the corneal surface points in axial direction. Surface curvature measures how fast the surface bends at a certain point in a certain direction. 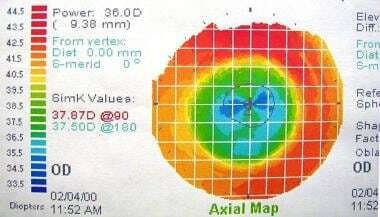 Axial curvature (formerly termed sagittal curvature) measures the curvature at a certain point on the corneal surface in axial direction relative to the center. It requires the calculation of the center of the image, which cannot be measured directly. Meridional curvature (formerly termed tangential and instantaneous curvature) measures the curvature at a certain point on the corneal surface in meridional direction relative to the other points on the particular ring. Meridional curvature maps always are more sensitive measures of local curvature change. Axial curvature maps can be derived from meridional maps. Axial value at a certain point equals the average meridional curvature along the radius from the map center to the point of interest, thereby approximating the average refractive power. Axial and meridional maps should be displayed theoretically in the units of radii of curvature (ie, mm) at each corneal surface point. For ophthalmologists who better understand more clinically used units of D in ophthalmic practice, the instruments display curvature in units of keratometric D and constitute so-called axial or meridional power maps. Elevation is not measured directly by Placido-based topographers, but certain assumptions allow the construction of elevation maps. Elevation of a point on the corneal surface displays the height of the point on the corneal surface relative to a spherical reference surface. The reference surface in most instruments was chosen to be a sphere. Best mathematical approximation of the actual corneal surface called best-fit sphere is calculated by instrument software for every elevation map separately. The same surface may appear to be different when mapped against different reference surfaces. Consequently, directly comparing 2 elevation maps that likely have slightly different best-fit spheres as reference values is difficult, and comparison only can be intuitive. To understand intuitively the theoretical difference between the elevation and curvature, imagine a corneal surface on the image below. The spherical curvature A-B and C-D are clearly the same, although the elevation is quite different. As in laser refractive surgery, the refractive power is changed by removing tissue from the corneal surface, and elevation data appear more relevant for calculation of ablation depth and optical zones. See the image below. Theoretical difference between elevation and curvature. 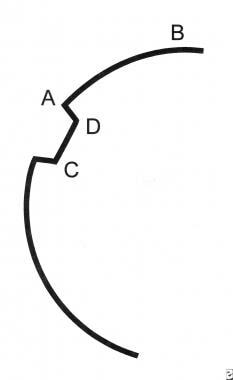 Spherical curvature of A-B and C-D is clearly the same, although the elevation is different. Notice that, in practice, the colors in the same region of elevation and axial curvature maps are often reversed. The vertical 90° axis is steeper in those incidences of with-the-rule corneal astigmatism. Therefore, the superior area is typically depressed (blue on elevation map and steeper, red on axial map) as seen on the image below. The bow tie pattern on the axial map is just a different mathematical representation of an oval spherocylindrical surface. It is not seen on the elevation map that is created from the x, y, and z coordinates of the usual representation of data in a 3-D world. See the image below. Symmetric bow tie typical for regular astigmatism. Simulated K (SimK): Simulated keratometry measurements characterize corneal curvatures in the central 3-mm area. The steep simulated K-reading is the steepest meridian of the cornea, using only the points along the central pupil area with 3-mm diameter. The flat simulated K-reading is the flattest meridian of the cornea and is, by definition, 90° apart. These readings give an idea about the central corneal curvature that is frequently visually most significant. The 3-mm diameter was chosen primarily from historical reasons for the purpose of comparison with standard keratometry that is used for analysis of 4 central points, 3.2 mm apart. The index of asphericity: The index of asphericity indicates how much the curvature changes upon movement from the center to the periphery of the cornea. A normal cornea is prolate (ie, becomes flatter toward the periphery) and has the asphericity Q of -0.26. A prolate surface has negative Q values and positive oblate surface values. Most myopic laser vision corrections change the anterior corneal surface from prolate to oblate. Indexes that characterize the uniformity and optical quality of the anterior corneal surface: Currently, best spherocylindrical correction that is used in glasses, soft contact lenses, and laser vision correction and is reflected in keratometric indexes does not correct all the optical aberrations of the corneal surface. The best visual acuity also requires uniform smooth anterior corneal surface. A variety of these indexes try to relate the variability of the actual values of the anterior corneal surface obtained by corneal topography to the optical quality and potential best visual acuity that would be permitted by the anterior corneal surface. These indexes can be thought of in clinical practice as different mathematical estimates of the visual disturbance that can be expected to be caused by the amount of irregularities of the anterior corneal surface. Many indexes specific for each instrument exist. Examples include surface regularity index (SRI), corneal uniformity index (CUI), predicted corneal acuity (PCA), and point spread function (PSF). 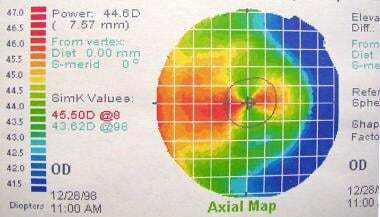 Note that patients with normal corneal indexes can have poor vision caused by disturbances in any other part of the optical system of the eye. Limitations of corneal topography: The error of corneal topography is under optimal conditions in the range of ±0.25 D or 2-3 µm, but, in those abnormal corneas seen in clinical practice, it often is ±0.50-1.00 D due to several limitations. The imaging requires an intact epithelial surface and tear film. Some of the errors of the Placido-based systems are as follows: focusing errors, alignment and fixation errors with induced astigmatism, difficulty to calculate the position of the center from the small central rings, increased inaccuracy toward the periphery because the accuracy of each point depends on the accuracy of all preceding points, and other errors. Different technologies use different measurement methods and algorithms; thus, the output data are not directly comparable. Also, the technologies undergo constant modifications, and the results of studies comparing the instruments are outdated quickly and difficult to interpret for practical clinical purposes. In addition, normal spherocylindrical surface imaging techniques should be able to characterize various more complex optical surfaces, as follows: very steep or flat corneas, keratoconus with local steepening, sharp transition zones after uncomplicated refractive surgeries, diffusely irregular surfaces after penetrating keratoplasty, complex surfaces after complicated refractive surgeries with decentered ablations, and central islands. These optical surfaces are more difficult to measure. For example, 7 commercial topographers have been tested on nonspherical models, and errors greater than 4 D may occur. The normal cornea flattens progressively from the center to the periphery by 2-4 D, with the nasal area flattening more than the temporal area. The topographic patterns of the 2 corneas of an individual often show mirror-image symmetry, and small variations in patterns are unique for the individual. The approximate distribution of keratographic patterns described in normal eyes includes the following: round (23%), oval (21%), symmetric bow tie typical for regular astigmatism (18%) (see the first 2 images below), asymmetric bow tie (32%) (see the third image below), and irregular (7%). Detection of corneal pathologic conditions, most importantly keratoconus and pellucid marginal degeneration: Corneal topography is often used clinically for detecting and evaluating the severity of keratoconus (see the image below). In clinical practice, the topographic diagnosis of keratoconus is often suggested by high central corneal power, large difference between the power of the corneal apex and of the periphery, and disparity between the 2 corneas of a given patient. 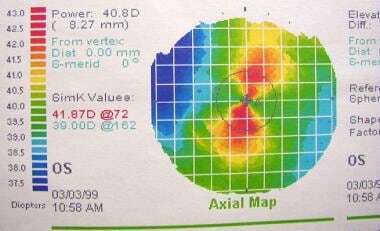 Corneal topography often is used clinically for detecting and evaluating the severity of keratoconus. Corneal topography has detected changes suggestive of early keratoconus in many patients without classic clinical manifestations of this disease that are often classified as subclinical keratoconus. Corneal topography is not sufficient for the definitive diagnosis of keratoconus because other disorders, such as corneal warpage from contact lens wear, can simulate early keratoconus. No history of contact lens wear, corneal stromal thinning, and other clinical signs would confirm the diagnosis of keratoconus. Several quantitative indices to diagnose keratoconus topographically have been proposed. For example, central steepening greater than 47.2 D, inferior-superior asymmetry index over 1.2 D, and high index of irregular astigmatism have been suggested for topographic diagnosis of keratoconus. Automatic diagnosis of corneal disorders based on corneal topography by the instruments has been improved recently with the use of mathematical algorithms called neural networks. These algorithms are programmed to improve by themselves with experience, and, after a period of training on several hundred corneal topographies, they are reported to be highly specific. Screening before refractive surgeries: The detection of keratoconus is of particular importance in patients who plan to undergo refractive surgery. It can look for risk factors of ectasia such as an inferior-superior index over 1.2 or irregular astigmatism. Evaluation of irregular astigmatism, especially after penetrating keratoplasty: Corneal topography is mostly valuable for detection of postoperative astigmatism, planning of removal of sutures, and postoperative fitting of contact lenses. Evaluation of the effects of corneal refractive surgeries: Corneal topography is useful for evaluation of effects and stability of all refractive procedures (see the image below). The value for guiding refractive treatments is currently evaluated. 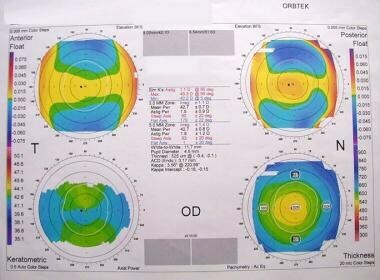 Corneal topography is useful for evaluating both the effects and the stability of all refractive procedures. Contact lens fitting: Corneal topography is especially valuable in fitting complex corneal surfaces (eg, after penetrating keratoplasty). Post refractive cataract surgery: Several formulas use the K readings from the topographer to help calculate the effective corneal power after refractive surgery to help calculate the intraocular lens needed for cataract surgery. The posterior apical radius (PAR) imaging device projects a regular pattern of lines or grid of known geometry onto the anterior corneal surface that is viewed from an offset angle. The topical fluorescein is used to stain the tear film, and cobalt blue light is used to illuminate the pattern. The accuracy and reproducibility is in the range of Placido-based systems, but the advantage is that the PAR system does not require an intact epithelial surface. The Orbscan corneal topography system uses a scanning optical slit design that is fundamentally different from the corneal topography that analyzes the reflected images from the anterior corneal surface. The high-resolution video camera captures 40 light slits at the 45° angle projected through the cornea similarly as seen during slit lamp examination. The instrument's software analyzes 240 data points per slit and calculates the corneal thickness and posterior surface of the entire cornea. The anterior surface of the cornea initially was calculated in this manner; however, since the calculation from the reflected images used by corneal topography is more precise, the current version of Orbscan is using the latter method and is a combination of reflective corneal topography and optical slit design. With the interpretation of the abnormalities of the posterior surface of the cornea, take note that the posterior corneal surface contributes 7 times less compared to the anterior surface to the refractive power of the cornea. The refractive clinical significance of the abnormalities of the posterior surface is under investigation. The accuracy and repeatability of the instrument is reported to be below 10 µm and, under optimal conditions, in the range of 4 µm in the central cornea and 7 µm in the peripheral cornea. In clinical practice, it is even more dependent than corneal topography on many factors, such as the limited movement of the patient's eye, ability of patients to keep the eye wide open, optically clear cornea, and the presence of corneal abnormalities. The other limitations of current optical slit technology are the inability to detect interfaces (eg, after LASIK flap) and the longer time of image acquisition and processing compared to standard Placido-based topography. The Pentacam (Oculus, Lynnwood, Wash) uses a different method to image the cornea: Scheimpflug imaging. Scheimpflug imaging is based on the Scheimpflug principle, which occurs when a planar subject is not parallel to the image plane. In this scenario, an oblique tangent can be drawn from the image, object and lens planes, and the point of intersection is the Scheimpflug intersection, where the image is in best focus. With a rotating Scheimpflug camera, the Pentacam can obtain 50 Scheimpflug images in less than 2 seconds. Each image has 500 true elevation points for a total of 25,000 true elevation points for the surface of the cornea. The Pentacam actually has 2 cameras. One is for detection and measurement of pupil, which helps with orientation and fixation. The second camera is used for visualization of the anterior segment. The Pentacam is able to image the cornea such that it can visualize anterior and posterior surface topography, including curvature, tangential, and axial maps. The conventional microscope collects all the light reflected back from an object, along with light from above and below the focal plane. This creates noisy, blurred images with limited resolution. Consequently, the specimen needs to be thinly sectioned. This need to physically section the specimen clearly does not allow in vivo imaging. In confocal microscopy, the pinhole source of light and its conjugate pinhole detector limit the passage of light from outside of the focal plane. The field of view of such a design is very small, and a full field of view must be built up by scanning. It can be achieved by rotating discs with thousands of optically conjugate source-detector pinholes or by a scanning mirror system. Some of the confocal systems use a laser light source that is scanned across a specimen in a raster pattern; these are called laser scanning microscopes. The limitation is the necessity to obtain multiple sections to evaluate larger areas of cornea and the time of image acquisition and processing. Time to acquire a single image is typically less than 1/30 second, and the observation time in clinical settings is around 5 minutes. In clinical practice, confocal microscopy has been used to identify Acanthamoeba cysts and trophozoites, bacteria, fungi, and other pathogens in the cornea. In clinical research, it can be used for evaluation of responses and complications after refractive procedures, corneal healing processes, and various corneal diseases. In experimental studies, it can be used in any application that requires the imaging of the cornea at a microscopic level. Epithelium: The must superficial layer of the cornea, the epithelium measures approximately 54±7 µm centrally and 61±5 µm peripherally. It is composed of 3 cell layers: basal, wing, and superficial. On confocal microscopy, these uniform polygonal cells reflect poorly, but the cell borders and nuclei reflect brightly. Bowman layer: This acellular layer has poor reflectivity on confocal microscopy and is difficult to directly image. However, landmarks such as subbasal nerve plexuses can point to its approximate location. Stroma: The corneal stroma is composed of a combination of keratocytes, collagen, and amorphous ground substance. All 3 of these components exhibit poor reflectivity, but the keratocyte nuclei reflect brightly in this relatively dark backdrop. Additionally, hyperreflective nerve bundles can be seen coursing throughout the stroma. Descemet membrane: Much like the Bowman layer, the acellular property of the Descemet membrane makes it difficult to image on confocal microscopy. However, elongated nuclei characteristic of deeper corneal keratocytes and endothelial cells can allude to its location. Endothelium: This single layer of hexagonal cells represents the innermost layer of the cornea. The cell borders reflect brightly, but, much as in specular microscopy, the nuclei are indistinct. In this way, the structures of the anterior segment can be visualized with a high degree of resolution (currently 18 microns axial and 60 microns transverse). This allows imaging of fine structures such as LASIK flaps, Schlemm canal, and lenticles from DSAEK surgery to be easily obtained. Additional benefits of this technology are that it is noncontact and uses no coupling medium. Therefore, structures such as the angle, iris, and lens can be seen in their natural state. Previous technologies, such as ultrasound biomicroscopy, required supine positioning and a coupling medium. These maneuvers could artificially deepen the anterior chamber angle. OCT can also easily visualize iris tumors and cysts as well as intracorneal rings or the positioning of haptics from anterior chamber or sulcus intraocular lenses. The use of light as an analysis medium also has its drawbacks. For example, the depth of penetration does not allow adequate visualization of the ciliary body for tumor. Also, the image quality is greatly reduced when attempting to penetrate corneal opacities such as scarring or pannus. High-frequency high-resolution ultrasound biomicroscopy (UBM) is similar in principle to traditional immersion B-scan ultrasonography. In general, the resolution and depth of penetration are affected by transducer frequency. The traditional ultrasonography of the whole eye uses a 10 MHz transducer, with approximately 150 µm resolution. Higher frequency of a 50 MHz transducer increases the tissue resolution to 50 µm but only at the expense of decreasing tissue penetration depth of 4-5 mm sufficient to image the anterior segment. Scanning of the cornea is possible with a 100 MHz transducer that increases the tissue resolution to less than 20 µm. The tissue resolution of 5-20 µm distinguishes the layers of the cornea and the corneal flap after LASIK and characterizes the 3-D structure of the cornea at this precision level under normal or pathologic conditions. Another advantage is that the imaging of the anterior segment is possible even through edematous or scarred corneal tissue. Krachmer JH, Mannis JM, Holland EJ. Cornea. First ed. St. Louis, Mo: Mosby Year-Book, Inc; 1997. 1-2253. Gills JP et al. Corneal Topography: The State of the Art. Thorofare, NJ: Slack Incorporated; 1995. 1-328. Kaufman HE, Barron BA, McDonald M, Kaufman SC. Companion Handbook to the Cornea. Butterworth Heinemann; 2000. 947-59. Karnowski K, Kaluzny BJ, Szkulmowski M, Gora M, Wojtkowski M. Corneal topography with high-speed swept source OCT in clinical examination. Biomed Opt Express. 2011 Sep 1. 2(9):2709-20. [Medline]. [Full Text]. Liu Z, Huang AJ, Pflugfelder SC. Evaluation of corneal thickness and topography in normal eyes using the Orbscan corneal topography system. Br J Ophthalmol. 1999 Jul. 83(7):774-8. [Medline]. Byun YS, Chung SH, Park YG, Joo CK. Posterior Corneal Curvature Assessment after Epi-LASIK for Myopia: Comparison of Orbscan II and Pentacam Imaging. Korean J Ophthalmol. 2012 Feb. 26(1):6-9. [Medline]. Kaufman SC, Musch DC, Belin MW, et al. Confocal microscopy: a report by the American Academy of Ophthalmology. Ophthalmology. 2004 Feb. 111(2):396-406. [Medline]. Dhaliwal JS, Kaufman SC, Chiou AG. Current applications of clinical confocal microscopy. Curr Opin Ophthalmol. 2007 Jul. 18(4):300-7. [Medline]. Mustonen RK, McDonald MB, Srivannaboon S, Tan AL, Doubrava MW, Kim CK. Normal human corneal cell populations evaluated by in vivo scanning slit confocal microscopy. Cornea. 1998 Sep. 17(5):485-92. [Medline]. Fujimoto JG. Optical coherence tomography: introduction. Bourna BE, Tearney GJ. Handbook of Optical Coherence Tomography. New York: Marcel Dekker; 2002. 1-40. Dada T, Sihota R, Gadia R, Aggarwal A, Mandal S, Gupta V. Comparison of anterior segment optical coherence tomography and ultrasound biomicroscopy for assessment of the anterior segment. J Cataract Refract Surg. 2007 May. 33(5):837-40. [Medline]. Holladay JT. 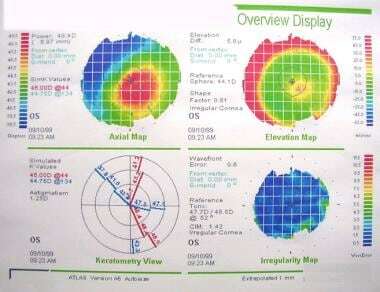 Corneal topography using the Holladay Diagnostic Summary. J Cataract Refract Surg. 1997 Mar. 23(2):209-21. [Medline]. Rabbetts RB. Clinical Visual Optics. Butterworth Heinemann; 1998. 378-420. Schuman JS. Ophthalmic imaging and diagnostics. Ophthalmology Clinics of North America. 1998. 11:1-490.